Is there more to spending time outside than exercise and fresh air? 54% of humans live in urban environments, a number that is set to continue and steadily increase. There are a lot of benefits to living in the city and arguments both for and against it from an environmental stand point. Whatever your beliefs in this area one key problem that arises from city living is the lack of the natural world. Everything in the city is man made. Concrete roads and pavements, plastered walls and ceilings, cars and buses, the list is endless. Even the areas that appear natural often aren’t, mowed grass, weeded flower beds, and neatly lined up trees. If Mother Nature had her way there would be some serious renovations. Every living thing on this planet has evolved to be at the point it is right now. Plants, insects, mammals whatever the species they have all slowly morphed and changed to survive to their specific circumstances. Humans are no different. We are the direct outcome of our own surroundings. We have been evolving for approximately 200,000 years to fit our surroundings which for the majority or our existence was the natural world. Foraging, hunting, exploring, finding shelter, working with nature rather than against it, that is what we have come from. It is only in the last small portion of our existence that we have started moving away from that lifestyle to live in our man made cities. On the surface it seems to be working , we are surviving, the population is increasing, cities are growing. But what impact is our disconnection from nature having on our evolution? It is too early to say for certain how this is affecting us but we have been able to see how the modern, changing world has affected other species with shorter life spans. The Peppered Moth, for example, pre industrial revolution, was made up of two variations, 98% of the species was white and black and 2% was fully black. Since the industrial revolution this changed dramatically and the black moths thrived to represent as much as 95% of the species. The theory behind this was that at the peak of the industrial revolution we were burning a lot of coal, which in turn polluted the landscape making everything darker from the soot. 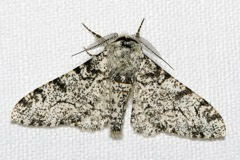 The lighter coloured moths lost their advantage from camouflage and the black moths gained an advantage. How does this tie in with us having the odd adventure? Because when we are out in wild places, looking up at the stars, cooking on a fire, pushing our bodies physically and mentally we are connecting to our evolutionary past. If you have spent time in the mountains then you have experienced that connection to nature on a much deeper level than is possible in the city. Your senses and intuition are magnified. “How much daylight do I have left? Every decision you make is about reading the environment and adapting. The more time we spend in these places the more we allow those traits to surface and survive. This is what we have evolved from and that is why it feels so right to be doing it. We aren’t designed to be sat indoors 8 hours a day at our desks, working on computers….at least not yet, so lets keep it that way! Newer PostFuel for the Fire - Is monoculture farming the answer?